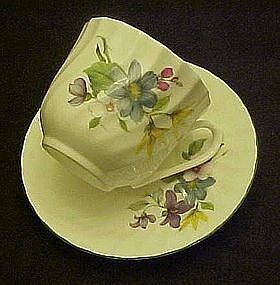 Pretty bone china cup and saucer set made in England by Baum Bros, Formalities. Swirl design with wildflowers of blue, yellow, white purple and pink. Green edge trim. Both pieces are excellent with no flaws Would make a pretty gift.